With Sister McKay’s words often the first thing I think of when I think of Maureen Whipple (or Virginia Sorensen for that matter, since I often conflate them), I was expecting “They Did Go Forth” to be a fairly edgy work, pushing the boundaries. And it was through that lens that I interpreted Tildy Elizabeth’s early actions in the story. She’s trying to read the Book of Mormon while sitting with her sick—practically comatose—child. Couple that with the flashbacks of the hardships she and her faithful husband had been though at the seeming whims of Brigham Young and I found myself reading a story about how Tildy had lost her faith after feeling rejected of God; she was now and had long been oppressed by men in the faith including Brigham Young, her husband and the best available quack. The doctor is an interesting case. Although doctor Priddy Meeks’s medicine is obviously bad to a twentieth-century reader, Tildy does not appear to doubt his expertise—indeed, she seems to believe he’s the best doctor between Orderville and Salt Lake City. How much of my described reading so far can be ascribed to my expectations and how much is actually in the text is a question I open to your judgment. However, it quickly becomes clear that what Tildy has lost faith in is her own power to save her child, her faith in a doctor’s power to save her child, her faith in any earthly means for her child to be saved including normal workaday prayers. Instead, she’s relying on divine intervention. Specifically, a visit from the Three Nephites. She just needs to finish reading the passage about the Three Nephites, if only the interruptions would end (Priddy even took the book from her and slipped it under her daughter’s pillow in hopes it might scare off witches). At this moment she receives a visit from a mysterious stranger who heals her child. The tale is reminiscent of the very similar (and equally wonderful) story “Christina” in Angela Hallstom’s Bound on Earth (originally published as “Unbroken” in Irreantum). But Whipple is not satisfied with a simple miraculous healing and instead adds another miracle to the story which I won’t mention here. Without getting into a closer analysis, “They Did Go Forth” appears to be a faith-promoting story. Without any particular sweetness and with plenty of detours, but, yes, ultimately affirming. When the 2321st word (of a 3128-word story) finally reveal’s Tildy’s last names—even though it is spoken by an ancient disciple of Christ who has come in response to her faith—I was uncertain whether to interpret “Stalworthy” as him calling her “still worthy” or hinting her worthiness had stalled. By keeping Tildy’s course, uneducated, lower-class, English accent from us until the final paragraphs, Whipple turns one final corner, leaving us standing, realizing how foreign and strange these long-ago people are. To force us to recognize Tildy’s alienness just as we had come to see her as the subject of a Sunday School story is the final bit of excellence. Sure you idolize these faithful pioneers of long ago. But are you anything like them? Theric, interesting background on that story. Tildy (Matilda) Stalworthy is actually a real person. (The correct spelling of her last name was Stolworthy, however.) She was my great-great-great Grandmother. The daughter that miraculously survived was named Elizabeth and was my grandmother’s grandmother. I remember her story being told at our gigantic Mormon family reunions when I was a little girl. 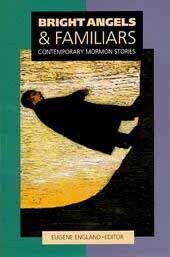 I have a different understanding now of how folklore works, especially in the Mormon tradition, and especially as far as Three Nephite stories are concerned. But we have family journal entries and a good amount of history as it pertains to both Matilda and Elizabeth, as well. It is clear that they both considered the miraculous visitation and healing to have actually taken place. When I wrote “my” version of the story, the version that wound up in Bound on Earth, the dialogue I used was taken verbatim from the family history that’s been passed down through the Jolley family (the huge Mormon clan that Elizabeth Stolworthy married into). Anyway: this has always been a meaningful story in my life. Miracles, family folklore, Maureen Whipple AND Eugene England?! Heady stuff for me. Glad you liked it. I have chills after reading post and comment. So I wasn’t imagining the connection. I just mixed up my causes and effects. As a storyteller, I appreciated the folk-narrative qualities in the story, and the O. Henry touch of the ending. Three Nephite stories are fascinating to me, living in California. How extensive is the motif in the inter-mountain region? That is a good question. I suspect, over time, they’ve been diminishing. Which seems like a bad sign. . . .
One of the things I find interesting about the story is that it is set, like a lot of Mormon literature, in Southern Utah, which seems to have a lot of mystical associations with it. It also takes place in Orderville, which I think was the most successful United Order community in Utah, relatively speaking. I think the United Order aspect of the story is interesting because so much of the story is about what happens when communities fail, or become powerless, and one is left to seek the help of the divine in order to survive. Maybe this failure of the community is meant to mirror her own failing faith? At any rate, I think it’s significant that as soon as her faith is restored, the community, likewise, is restored–which I think the cradle at the end is supposed to suggest. I think it’s also great that there is now some confirmed genealogy between this story and “Christina,” which is one of my favorite stories from “Bound on Earth.” It makes me want to go back and read that story to see what kind of deliberate conversation is going on between the two. Also, the second miracle is something very similar to something that happened to my great-great-grandfather–that is, it’s something I’ve always heard happened to him on his mission. Like you point out, it’s an extremely common motif in Mormon folklore, and I’m not sure it ever “really” happened to anyone in my family, although part of me would like to believe that it did. I still remember my older brother sharing that story in a primary talk. It is interesting, though, that Whipple uses both pieces of lore in her story, as if a part of the story itself is about the folklore. In light of the Orderville element, and the community theme, she could be saying something about the role of one in strengthening the other. If anything, these pioneer stories unite us because we share them–in many ways quite literally. Thanks for the write-up. I would have probably not read the story otherwise. Not this morning, at least. I should also note that I think it’s interesting that she is relying on the Three Nephites, and not Christ himself, to heal her daughter. This seems wholly consistent with my understanding of pioneer belief–and one way they differ from us today. I’ve been thinking a lot about intertextuality lately and this story, as has been pointed out again and again here, is a great example of how a text can can draw from what came before and what comes after to, simply, make it more. And I don’t think I had thought enough about the community elements. Writing about the United Order pretty much demands such a reading, but I let it slip by. I admit that I’m not as impressed by this story as I’d like to be. Like Theric, this is my first actual reading of Whipple, and given her reputation I read the first parts of it as a story about the loss of faith and how inhumanly hard Utah pioneer life was on women. Even after it turned out to be faith-affirming, however, I wound up not actually liking the characters very much — or feeling that Whipple liked them either. (A common issue in realistic American fiction of the early 20th century, in my experience: it often dramatizes the lives of the poor without providing any sense of of real kinship with them.) Theric’s closing comment, that the story seems to ask the question, “Sure you idolize these faithful pioneers of long ago. But are you anything like them?” is a fairly gentle version of what I feel. And by the way, what’s all this about Priddy Meeks warning Tildy that a witch might have cursed her child? Was belief in witches truly that common among late 19th century Mormons? I’m far from an expert on such things, but I don’t recall warnings against witches turning up anywhere in my reading of and about the lives of 19th century Mormons. It’s as if Whipple has borrowed something from 200+ years earlier, just to make sure that we won’t see the doctor as in any way a modern spirit. I’m also confused by a plot point. Early in the story, I get the impression that Tildy is going to perform some kind of summoning, or praying to the Three Nephites, or something. After all, she feels the need to hide what she’s doing from the others, and says they wouldn’t approve. But if all she’s doing is reading the passage (and not even praying, so far as I can tell…) Then, when a mysterious old man does show up, it doesn’t even occur to her that it might be exactly what she’s been hoping for! Frankly, it makes her seem stupid, which (for me) goes along with how Whipple has been depicting her all along. I think the message of this story is that miracles were real for our pioneer ancestors, but can’t be real for us because (a) as educated moderns we’re too different from them, and (b) their lives were too inhuman for us to want to live that way even if we could. Sorry, I’m not sure what question you’re answering? Wm says: the reason it was unclear is that that was clever comment spam that grabs other comments recombines them and posts them.